Salads are good year round. Our family has one pretty much every day for lunch (and sometimes breakfast ;). Yep! My husband loves salad for breakfast. 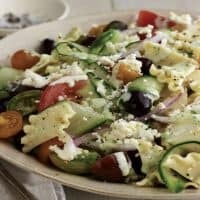 This Greek pasta salad with Feta cheese is what we reach for as spring and summer veggies make their way into our garden. Roland Kalamata Olves, Pitted, 5LB (2.27kg) We like to prep it in advance, so we can make the salad in literally just minutes. We cook the pasta and chill it for up to 2 days. Then, when we’re ready to eat, we just add our favorite veggies straight from the garden (or from the farmer’s market). The best vegetables to use for Greek pasta salad are tomatoes (we love heirloom tomatoes that come in lots of different colors, but you can use any tomato you have access to), cucumbers, onions (red onions give an added visual appeal), green and red bell peppers, etc. You can add your favorite olives. 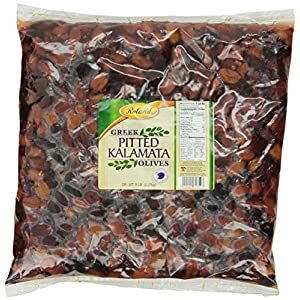 We prefer Kalamata olives: YUM! Sour cream mixed with dill, oregano, garlic, lemon zest and juice, a pinch of salt, and some vinegar is creamy and full of flavor. Combine ½ cup of the feta with the sour cream, dill, oregano, garlic, lemon zest and juice, a pinch of salt, and the vinegar in a food processor and pulse a few times. With the processor running, slowly add the olive oil until combined and smooth. Combine the pasta, cucumbers, tomatoes, and onion in a large bowl. Add the dressing and toss to coat well. Top with the remaining ½ cup feta and the olives. Drizzle lightly with additional olive oil andbalsamic vinegar just before serving chilled or at room temperature. If you want to serve this for a special occasion, use a fancy flat pasta like Rombi by Bionaturae.